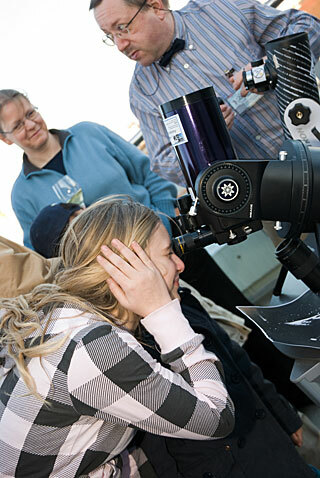 Astronomy organizations of all types have regular public events. In 2009, in recognition of the International Year of Astronomy (IYA2009) the number and diversity of events available was unprecedented. The entire Wisconsin astronomical community coordinated events around IYA2009. Although IYA2009 has come and gone, organizations all across Wisconsin continue to have regular public and special events. We will highlight a few of the special events on this page. Remember to check our Calendar page for a complete schedule of all things astronomical in Wisconsin. The Sheboygan Astronomical Society is hosting an Astronomy Swap & Shop at the Aviation Heritage Museum on Saturday, March 23, 2019 from 9am to 2pm. Bring anything you’ld like to sell or swap, or just come as you are and meet your fellow Wisconsin stargazers. During the International Year of Astronomy 2009, the goal was for 10 million people to look through a telescope sometime during the year. In Wisconsin, our goal was to get 5,000 people to look up at the night sky. After reports came in from around the state, we know we exceeded that goal!